Ladies and gentlemen - welcome to the first of two posts which are all about the Making A Mark Awards. This is the third year of the MAMAs and most of them are entirely decided without any consultation or voting! Get your hot drink of choice and find a comfy seat - this is a long one and comes in two parts! Click the links to view the shortlisted works and vote. 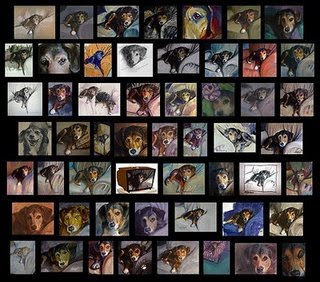 The Best Art Blog Project of 2008 Virtual Challenge Cup goes to Karin Jurick's blog project Different Strokes from Different Folks. This project is relatively new but it was well thought out, hit the ground running, attracted participants very quickly and has achieved an awful lot in a very short space of time. Currently 65 pairs of participants (130 people!) are engaged in a three week long portrait swop! Karin provides guidance to participants how to improve their art. Primarily this has been about encouraging people to see that using photos as references need not involve copying - that making choices, using your imagination and interpreting a photo are skills which are also important. She's latterly started providing mini tutorials. Karin is a firm but fair project leader. She resists inappropriate 'short-cuts' which others might call cheating - and that includes painting over pre-printed images! Hurrah! She also refuses to post images which are not up to standard - thus encouraging people to get to grips with producing more satisfactory images for us to look at. Hurrah again! In short she sets a standard and creates a set of expectations about the levels of skill that people are expected to get to grips with. I so wish there were more Karin Juricks in this world and completely support everything she is doing and asking of the people participating in this blog and project. 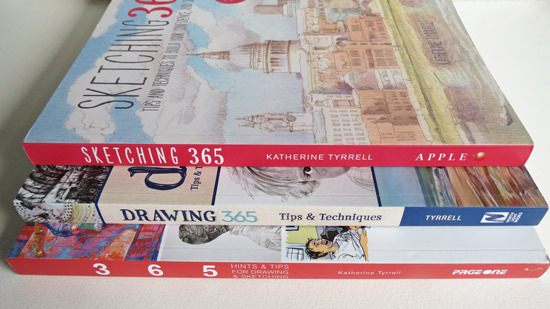 The Urban Sketchers blog. This grew out of an existing Flickr group so started with a ready-made large group. It probably has the best track record in terms of switching people on to subscribing/following a blog. Both the number of contributors and visitors and visits are all growing very fast. 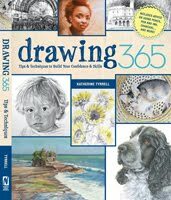 It's also great because it shows just how many artists and illustrators really do go out with their sketchbooks and sketch from life on a regular basis. My only slight concern about this one is whether it's getting too big too fast and maybe losing a sense of community. The Virtual Sketch Date project which started quite casually in April and then exploded in terms of levels of participation. 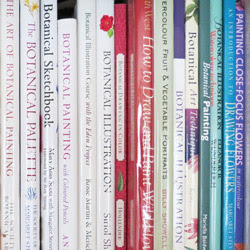 The project was created by Rose Welty (Rose's Art Lines ) and is now administered by Rose and Jeanette Jobson (Illustrated Life ) and Stacy Rowan (Stop and draw the roses ). The project has proved very popular and like the Different Strokes from Different Folks project uses the same reference photo to stimulate a variety of treatments by participants. For me, the lack of actual images all in one place (blog or Flickr site) lets it down and I do hope this issue can be resolved for 2009.
the Daily Paintworks site has survived a fairly radical change in participants - which is never easy - without missing a beat. the Illustrators' Partnership Orphan Works Blog provided a place where we could find out how the campaign on orphan works was progressing - but is essentially a tool for communication with a very large group of artists' and illustrators' organisations and interested individuals. Danny Gregory's Illustrated Life book would not have come into being but for artists who like to sketch and a community of bloggers who like to display their sketches. This was a project which emerged out of sketching and blogging about it rather than an art blog project per se. 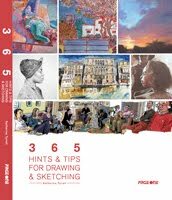 The winner of this prize in 2007 was the International Sketchcrawl drawing marathons. 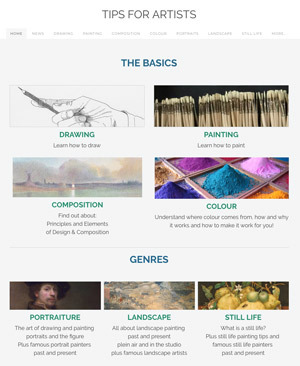 If you go and look at my Making A Mark website you'll see that my activities are divided into three areas - drawing, writing (which includes this blog) and sharing. I place a great deal of importance on sharing information. Sharing what you know only costs the time it takes you to share while it can enable others to profit from that knowledge - both literally and metaphorically. That's why one of the really important Making A Mark Awards focuses on people who share useful information. I'd like to emphasise that I'm always inclined to give a great deal more credit to any people who share information for free - what they share is a complete gift. 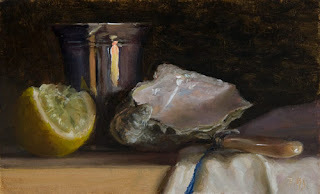 Linda Blondheim (Linda Blondheim Art Notes) provides lots of practical tips from the perspective of a full-time working artist with years of experience. The winner of The FAQs and Answers Really Useful Medal for 2008 is James Gurney (Gurney Journey). I decided that James very much deserved this award because of the vast number of posts he has provided during the course of this year (and last) which have been both extremely informative and highly educational. 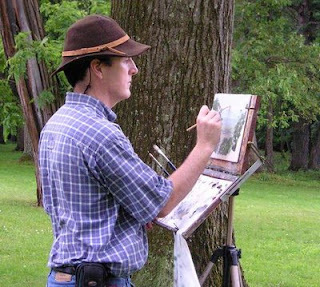 James is a one-man course in how to draw and paint! People pay fees for workshops from tutors who know much less than James does! If you want to learn about how to improve your art I recommend spending some time digging around in James's archives. For example his collection of posts about Composition (23) and Lighting (32) are superb and set an excellent standard for others to try and emulate. Then there's Preliminary Sketches (28, Paint Technique (37) and.........good posts with sound advice never become out of date! This award is about making me think about the matters which are highly relevant to the activities of artists who are operating online. Anybody who knows me well knows that I really like people who make me think! They're generally people who like to think about what to do and how to get things done and why one approach might work better than another. Lisa Call Lisa Call - Contemporary Textile Art often has an interesting perspective on matters to do with making art, the business of being an artist and getting things done. ....here is the good news. According to Lindauer, new research reveals that over time, creative people increase both the quality of their artistic output, and the quantity, over their lifetimes, with productivity peaking during their 60's, but the quality of the output remaining steady at the lifetime highs well into the 70's. I'd also like to give a special mention to all those involved with Watermarks which is a new blog I'm involved with. I'm really enjoying the very thoughtful posts and the discussions (on the blog and in our ning community) about art and how to approach it which these are generating. I'd like to say thank you to everybody who is involved for making it such a rewarding experience so far - and such an exciting prospect for the future. 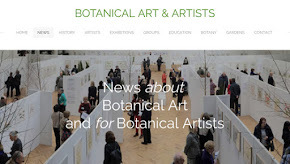 Alan Bamberger at ArtBusiness.com who doesn't have a blog and isn't an artist and consequently isn't eligible for this prize. Instead he prefers to write articles for both artists and art collectors. Nevertheless, he always makes me think whenever I read one of his articles - and he comes highly recommended by me. I eventually realised that when thinking about people who might be contenders for this award that many of them were not artists and/or didn't have art blogs. So I've decided to change my criteria and anybody who makes me think and offers insights which are transferable to the activity and business of being an artist is eligible. ....and on that basis Seth Godin (Seth's Blog ) is the winner of The Make Me Think Gong in 2008. I rarely miss reading one of his posts and very often find that they trigger thoughts about ways in which his thoughts could be applicable to the practice of art and/or marketing within the art economy. It's good to look beyond one's comfort zone to find stimulation! Here's a year's worth of his popular posts in 2008. Try reading Maybe you can't make money doing what you love. This award is called “The Moose” after Maggie Stiefvater’s cat Moose who broke ACEO $ records and won this award in 2006. It focuses on the animal(s) rather than the artist. 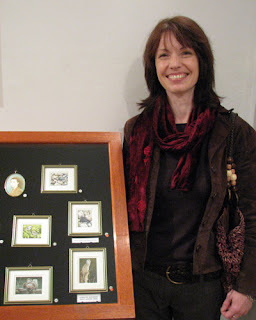 The winner of “The Moose”- award for the best animal in an illustrated blog is Tracy Hall (Watercolour Artist). This Award is just one of the many which Tracy has won in 2008 with various Miniature Art Societies in the UK and USA. This Award is for "birds" in a generic sense and a rook in particular and recognises two of her principal achievements in 2008. First, one of Tracy's birds - the Rook and Red Admiral won The Royal Miniature Society Gold Memorial Bowl. Many, many artists strive over a number of years to win this award while Tracy had never even entered a miniature art competition prior to 2008! Second, it recognises all the paintings Tracy produced over four years showing 187 species of birds in different locations for The Orkney Book of Birds which was published this year. Those of us who follow Tracy's blog have been able to see each of the plates on Tracy's blog as they were produced. Tracy has also won prizes this year at exhibitions held by the Hilliard Society of Miniaturists and the Miniature Painters, Sculptors & Gravers Society (MPSGS) of Washington, DC. Gayle Mason (Fur in the Paint) for a cat called Shred who subsequently became known as Aristocrat. This cat charmed visitors to the UKCPS stand at the Art Materials Live fair at the NEC and the Supreme Cat Show in 2007, emerged as a set of WIP images in 2008 and went to the Annual Exhibition of the Society of Feline Artists where he sold before the exhibition had even opened! Dermot – a rather charming if somewhat gruff Australian Old English Sheep Dog in Tuscany who writes his own blog (I Am Dog, Hear Me Snore) and has even trained his owners to take photos of him! He continues to make me laugh and it's absolutely nothing whatsoever to do with art! The Travels with a Sketchbook Trophy in 2008 is posthumously awarded to Cindy Woods. (Learning Daily). Her trip to Washington in August to see Pearl Jam in concert - Cindy's sketches of musicians in concert have always been a particular delight as not many people attempt these. Plus the Cindy Woods - Travel Sketchbooks Collection on Flickr - all of which were posted to her blog at various times. 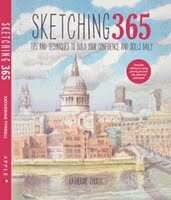 Special mention goes to Seattle journalist and illustrator Gabi Campanario and all the very many contributors to Urban Sketchers who I'm expecting will probably supply the winner of this award in 2009! 2006 - Julie Oakley won the “Get off your Blogging Bottom and Sketch”Brass Platefor her One Mile from Home blog). The Painting a Day 'movement' is now some three years old and some. During that time those who have been at it longest have produced some 1,000 small paintings. For me there is no question that three people who have been very consistent in terms of quantity and quality of output over this period are the three previous prizewinners of this award. 2007: Carol Marine (Carol Marine's Painting a Day) who started on 5th October 2006 and and also manages the Daily Paintworks site. Now we're in Year 3 it's interesting to see who's still producing quality work on a regular basis. Those who have part of 'a painting a day' and who have been successful at generating a following and a number of collectors for their work have a solid track record of producing good quality small works on a very regular basis. I took a random look at the archives of various blogs for this one! To be honest what I found is a lot of people who are missing by a mile on the quantity of paintings posted to their blogs. I'm almost tempted to ask whether the painting a day movement has died. As many people will appreciate by now, it's not essential to produce a painting every day. 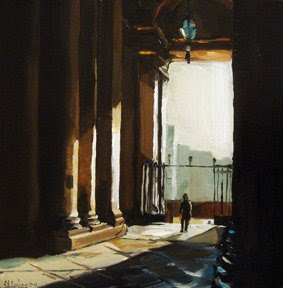 Good daily painters are those who generally try to paint every day but also have other commitments which call on their time and consequently tend to have a few paintings in hand so they can still post nearly every day. Plus of course there are lots of people who now balance commissions with their small paintings. However, to be able to step up to the mark for this award it's not enough to be producing work from time to time or work which isn't consistently good. This also isn't about working on larger paintings on a daily basis. The winner of the Painting A Day Stickability Shield is Edward Gordon (Edward B. Gordon) who started doing daily paintings back in November 2006. Apart from the last four days Edward has created a painting a day every day this year. The same in 2007. He completed 700 daily paintings back in October. His blog is popular and it indicates that he sells most of the paintings he produces. Today, his blog will post the 769th daily painting since 20th November 2006. The runner up is Abby Ryan (Ryan Studio) who's been producing almost daily paintings since 23rd September 2007. Jared Shear would certainly have been a contender if his 365 day project posted at Cougar Peak-A-Boo had been around in 2008 (it finished on 31 st December 2007). There's a message in the above for all those who want to be an artist in a recession - and for all those who have a "view" out of their window. 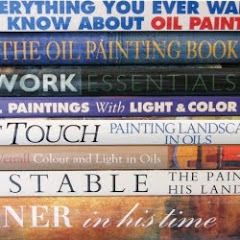 'Will you be a success if you blog your paintings daily' has been one of my most visited blog posts. ‘The Stickability factor’.This has proved to be an extremely popular blog post - and is also testament to the fact that writing on regular basis can mean that sometimes good posts just write themselves! 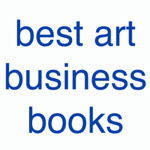 Categories art, art blogs, making a mark, Making A Mark Awards, who's made a mark this year? Gruff? I'll put my boofy paw in the air to that one. Rather charming? Either you've been smoking something you shouldn't have or I've let my standards slip. My CV, after all, does include Misanthropy For Dummies. Regardless, thanks for the mention. Presumably the kilo of Meaty Bites in the plain brown envelope weren't enough to swing it for the big gong? thanks for the mentions about Urban Sketchers and my blog, a real honor! Thank you for mentioning 'Aristocrat' Katherine, and well done Tracy on winning The Moose award, really well deserved. Congratulations to all the other award winners. I think the kudos should go to Making a Mark regarding that post which clearly was no small undertaking. I am honored to be a contender. Thanks so much for the mention. thank you so much dear Katherine, an honour, an honour indeed ! I'm so moved by your awarding Cin the travel sketchers award this year----you were so right to do so! Cin's whole life was a journey that she continually documented, even the last, narrow passages. Well done. Thanks for mentioning the humble VSD. Congrats to all the winners. So much work involved here Katherine...it's really fun for the rest of us - thank you! What work you've put into this post Katherine. You should be paid for all this! And the choices are perfect and so well deserved. Exquisite works abound on these artists' blogs and the writing always makes me think. Thank you for all you do Katherine. Its never said enough to you and should be. I just had to pop in here and say that I really thought the mentions here were VERY WELL DONE and entirely deserved. In particular, James Gurney's blog is an amazing thing to behold and invaluable to any starting artist. So much interesting reading, so many exciting links to follow up. I am pleased I have four days off work coming up; I think I am gong to be spending some serious net surfing time. Thank you Katherine. I have to agree with Tina, there should be an award for Making A Mark which is truly ourstanding. I can't imagine the work, research and time that must go into it. I love going through the links, the quality of blogs and posts you highlight are always extremely high. Thanks Katherine!! 21st December 2008 - Who's made a mark this week? 14th December 2008 - Who's made a mark this week? 7th December 2009 - Who's made a mark this week?